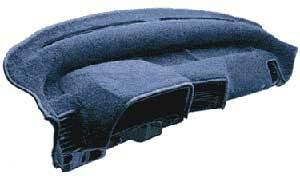 We specialize in quality dash covers (also known as dash mats). With thousands of patterns in stock, we can make you a cover to fit your vehicle. It doesn't matter if you have a car, truck, van or SUV. Each cover is individually cut and shaped to fit almost every car, truck and van made. We use high quality luxurious color fast and shrink proof fabric, stitched and edged entirely by hand. All vents and openings are precut. Your cover will not only enhances the appearance of your interior, but it will protect your dash from the suns harmful rays adn reduce interior heat and glare. Helps stop dash cracking and warping. Beautiful finsh with felt edge.